It's Friday night, I've spent most of the day van shopping for the wife before getting a couple of hours on the roads project. I want to finish that one but acrylic water effect stuff takes an age to dry! 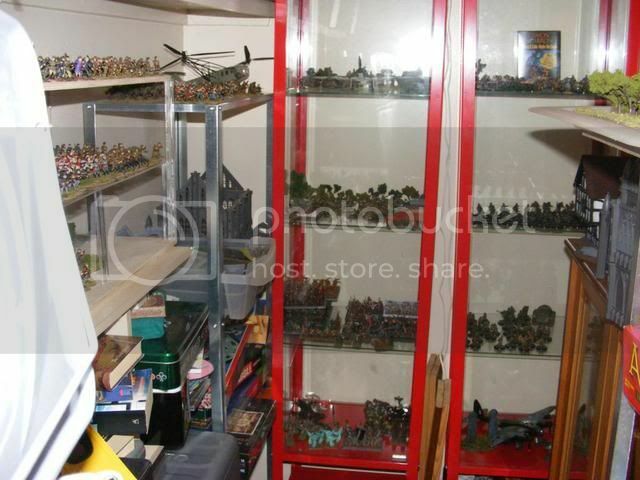 I then even based up a load of miniatures that were sitting around. I was going to try talking to the wife but she's engrossed in some awful TV programme. Instead I'd thought that I'd let you see where the chaos and occasional creation takes place, the Vanishing Cabinet. It is so called because my wife can make anything of mine from around the house vanish by shoving it in there! It's just a bog basic Ikea corner desk unit thingy but it does me proud. 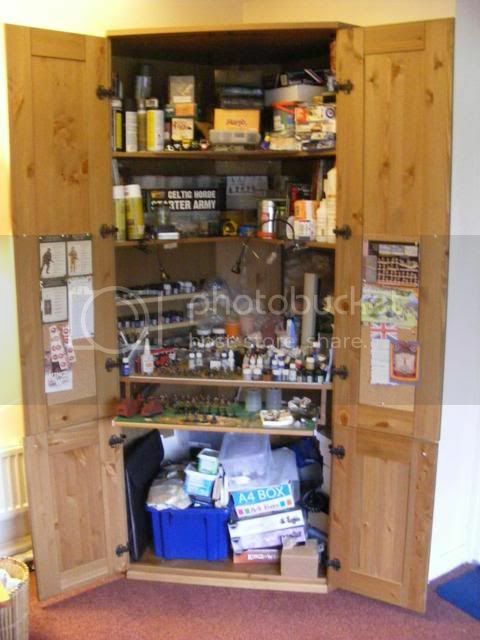 Of course, if you think that it is a little chaotic then you should check out the miniature cupboard! I really should work out why the display cases are misaligned by about 5 degrees! Hopefully I'll finish the roads project tomorrow and get photos up by the end of the weekend. Right now I'm going to try to work out how to make some halfway decent rivers! I was thinking that too, lol. Luckily I have another entire room to lose thing in.